First it was flurries - last night. It's a little early to get excited about snow, even though some ski areas are open. Our below normal temperature pattern is holding, yet this is just a balance of the heat we had in October and early this month. We are now just about normal at BWI as it stands today. Looking longer range, I have posted the 5 day GFSx. This is the upper level 500mb flow. 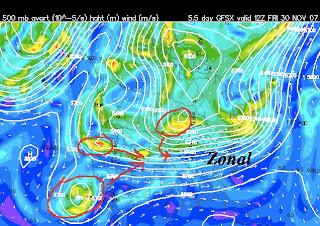 The spots highlighted are vort maxes, or pieces of energy that are ingredients for building storms.